eat, drink & be vegan: What will I do with this leftover Chickpea Ratatouille? What will I do with this leftover Chickpea Ratatouille? Many of you love Chickpea Ratatouille from Vive, but you know how sometimes you have leftovers, but not enough to make a full meal out of? When I find myself in this situation, and I don't want to just refrigerate the extras for lunches... often I freeze the leftovers until I decide how I might 'make it over'. This time, I realized I had two Vicolo pizza crusts in the freezer (they are packaged in 2's), I realized these nutty, spelt and cornmeal-based (and wheat-free) crusts would be a splendid base for the chickpea ratatouille. If your leftover ratatouille is a touch 'liquidy', you can either simmer to reduce it, or spoon it onto the crust leaving behind the extra juices. Then, embellish with your favorite toppings, that will complement the ratatouille base. We added some sliced olives, capers, and a fine shred of Sheese (we like a fine shred, but too much is very strong and overpowering, the Sheese varieties are all quite sharp and pungent). I have more to share soon. Last week was insanely busy. I can't even explain how much I ran and juggled with a birthday, my mom visiting from Newfoundland, preparing for a recital, school activities, etc etc. It was a blur of a week, but was also rather exhausting. So, I leave you with a brief post today, and will be back with more good stuff soon! And the pizza was fantastically delicious, you must know! This is a fantastic idea!! I've never thought of it before. Looks delicious, as always. 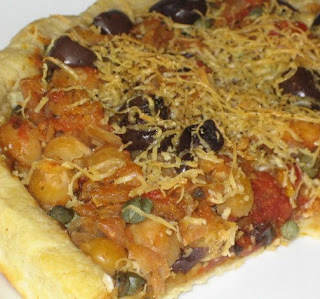 Chickpea Ratatouille pizza?!?!?! Oh my goodness, brilliant!! I MUST try that, for sure. Sounds like you've been keeping busy with fun activities, as always :0) Take care - looking forward to your next post! What an awesome idea for re-using leftovers! Love it! What a cool idea for leftovers! I'm sure that pizza was great! I LOVE ratatouille pizza! Finding ways to change up leftovers is great. Great post! Now that looks like one delicious, healthy pizza! neat! seriously. I was THIS close to putting leftover chana masala on pizza, well whole wheat pita, last night but made something more Italian instead. I'm making this right now!!!! It looks soooo delicious !!! I just picked up Eat, Drink and Be Vegan.... we have made about 10 recipes so far.. and they are all amazing. Ohhh, this looks so, so good! Why isn't this in my kitchen for me to serve for dinner tonight! I should *not* visit your blog when I'm hungry!